Measuring the costs of absenteeism and presenteeism is a challenging task. In fact, there’s no magic formula to do so. As far as absenteeism goes, many people have tried to simplify the process by adding together the wages and administrative expenses associated with the behavior. Along those lines, several companies and experts use the ‘absence rate’ as the ideal variable to identify and measure absenteeism. Poor goods or services because of understaffing or overtime fatigue. Safety issues from inadequately trained employees. Poor morale from employees who had to do extra work, and manager’s spending excess time on discipline and finding replacements. Considering the above, it is easy to find significant differences among some of the data on the costs of absenteeism and presenteeism. For instance, a recent report elaborated by the Employer Assistance and Resource Network (EARN) states that “each year workers in the U.S. miss more than half a billion work days,” which according to the Bureau of Labor Statistics results in financial losses of 40 billion USD per year. 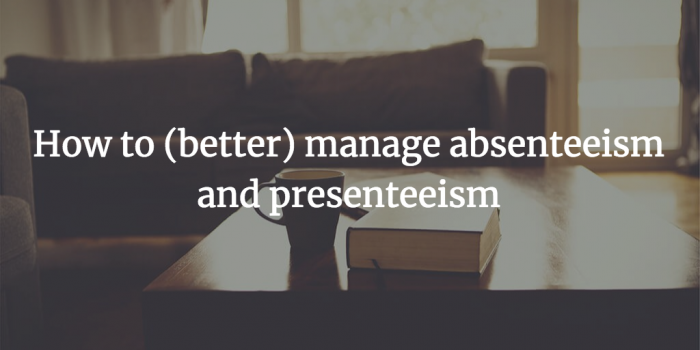 Why does absenteeism and presenteeism occur? What does “Assiduity at work” mean? When Neo meets Morpheus for the first time in the movie The Matrix, he needs to make a crucial choice: he either stays in his fake world and believes whatever he wants, or he takes a ride to wonderland to find out how deep the rabbit hole goes. Choosing to stay at home or attend work when feeling ill isn’t that dramatic, of course. However, once your alarm is off, you need to deal with the matrix of assiduity. Taking the definition from Eric Gosselin, assiduity is a person’s desire and ability to go to a location where he/she is expected to be. When applied to the work environment, that concept traditionally involves going to a workstation according to an established schedule. However, the idea that presence ensures performance is as fake as Neo’s world. According to Gosselin, management of assiduity at work would not force presence at all costs, but rather the worker’s presence or absence when the parameters of the situation call for it. And what are those parameters? Let’s take a look at some of the variables that cause absenteeism and presenteeism in the workplace. 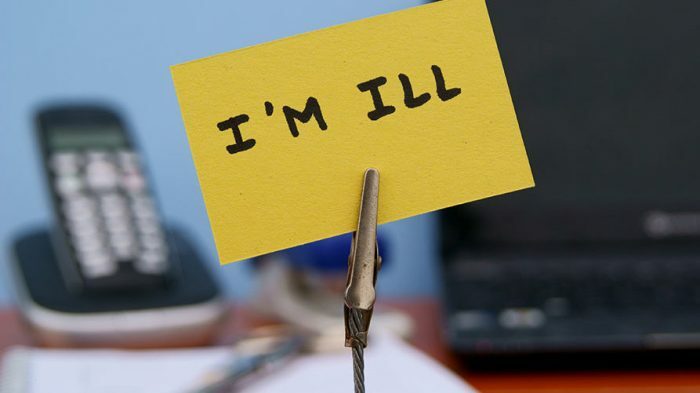 What causes employee absenteeism in the US or in the UK? Caregiving responsibilities for spouses, child or parent with a disability. Problems performing job tasks to supervisor’s satisfaction. Communication problems with coworkers and/or supervisors. Difficulties arising from activities of daily living such as using the toilet or eating. While minor illnesses and acute medical conditions remain leading causes of absenteeism, the impact that common mental health conditions and stress is having on this phenomenon has significantly increased in the last years. In fact, 55% of companies in the UK reported common mental health conditions in 2018 (compared to 41% in 2016). Likewise, 37% of companies have seen an increase in stress-related absences (compared to 31%). All of those questions and fears, as well as the individual and organizational factors mentioned, push people to a behavior defined by the following logic: “I better turn up, it’s better that my HR record shows that I am there, I am present… whether I am delivering or not, that’s irrelevant, I’m there,” explains Professor Cooper. A sense of duty or acting as a ‘good soldier’ who always has to be present. Fear of being stigmatized as someone ill. Fear of compromising job security. Feeling irreplaceable or essential for the company. Can’t stand staying at home. Complying with the limits of time off allowed by the company. An imperious need to catch up and take care of unfinished tasks. Our piece of advice for managers. Prevention – Setting up timely screenings of employees. Condition management – Adding plans that allow employees to stay on top of chronic conditions. Employee health engagement – Providing health plans that give employees tools and wellness programs that allow them to take an active role in their well-being. Adopting measures to improve employees’ quality work of life and job satisfaction that allow employees to meet their physical and emotional needs. Establishing a high performance work culture aimed at creating an adequate fit of the employee within the organization. Flexible work practices aimed at fixing the inadequacies associated with existing arrangements. Adopt employee time reports that allow you to effectively track the time people take off in a way that ensures the integrity of your main policies (e.g. paid time off, sick leave). Commit yourself to manage absenteeism. Enable workplace flexibility whenever possible. Create rewards and recognition for positive employee attendance. Provide consequences if an employee fails to attend work in a timely manner. According to the 2018 CIPD report, 86% of respondents in the UK report observing presenteeism in their organizations. In spite of that, only 25% of companies were taking steps to discourage presenteeism in the workplace (a drop from 48% in 2016). Considering the costs previously mentioned, that 25% difference is alarming to say the least. Let your appreciation be known. Offer support to your employees. Be open to ways to balance work and personal life. Encourage participation in decision making as much as possible. In her article for Raconteur, Karen Higginbottom highlights some successful cases regarding the management of presenteeism. For instance, the law firm Fletchers Solicitors has been able to reduce days lost to sickness by offering flexible working policies and personal resilience workshops that allow employees to identify and manage stress. Nobody says that building a well-being culture is an easy task. However, the price of making that effort is nothing when compared to the price a company pays for having high levels of absenteeism and presenteeism. All of this probably has you wondering if absenteeism and presenteeism are problems for your business. How would you even know if they were? As noted at the beginning of this post, there is no single formula for measuring these behaviors and their costs, but simply keeping track of absenteeism and productivity can still provide valuable insights. With BeeBole’s absence features you can set quotas and view used and available days off per employee. What’s more, you can track and compare absences for vacations, illnesses, public holidays, or custom classifications in visual reports. Is workload balanced? Can tasks be redistributed to ease pressure on employees who need it? Those who don’t use vacation time risk getting burned out, and those who are frequently sick might already be burned out. If you are looking to track costs of absenteeism and presenteeism, and to work to implement a well-being culture and other initiatives, start by setting clear goals and establishing a baseline of data to evaluate progress.